Heavens to Betsy such a commotion has rippled through the world of children's librarianship that one would think Dr. Seuss had been found alive and well in the woods of Montanna with a case amnesia and a fear of rhyming words. I am of course referring to the use of the word (hold your breath and cover your eyes, this is scary) scrotum in the Newbery Medal book Higher Power of Lucky by Susan Patron. Granted the word shows up on the first page, and may not be the most familiar word to kids. It may not also be a word that parents or educators really want to pop up every day in their children's conversations, but it is by no means a word that children should be unfamiliar with. (with which they should be unfamiliar? I hate that ending in a preposition thing.) Off the top of my head, I can think of dozens of words that would be much worse to have on the first page of a book, and I bet you can too. Personally I'm in favor of children and adults using correct medical terminology. I have not had the fortune to read Higher Power of Lucky yet, but my boss has an advanced reader copy I hope to get my hands on soon. I can not imagine not stocking this book because of one simple word. The librarians who are doing so should have their librarian stripes stripped. Granted, it is easy for me to talk from my large well-funded and well-supported urban library. I'm not dealing with a small town or hugely conservative community. But in all the cases of the book being pulled (and the tons of discussion on PUBYAC), I've not heard of a parent complaint. It seems to primarily be librarians pulling this book pre-emptively to avoid a complaint. Censorship battles can be hard, exhausting, and detrimental to our public image and librarians exist only upon the sufferance of the public good will. Picking your battles is all well and good, but don't retreat before the bugle call has sounded. Stock the book and wait. Most likely I imagine there won't be a huge battle and we'll all move on to more pressing issues. But let us not become our own enemies by censoring our libraries before any one else has the chance. We owe more to our public, we owe them a chance to see all the material and make up their mind about it. Just as we believe that no one group has the right to dictate what stays on the library shelves for the general public and we fight for books such as And Tango Makes Three, we have to remember that librarians don't have the right to censor either. There are many more popping up, but I'll leave you with those two. I've photo shared before but I was asked to do it again for the sake of library 2.0. I was also asked to take pictures of my favorite place in Kansas City and share them. However this assignment was given in January and February when we've been unusually cold and frigid and covered in ice and snow. So I didn't get to the park like I meant to. Instead you get pictures of the library (see previous post). And I have an online photoalbum. Check it out! BornLibrarian's Photos! I created a second professional photo album for similar reasons to why I created a professional blog months ago. This photo album will be a permanent link on the side bar. 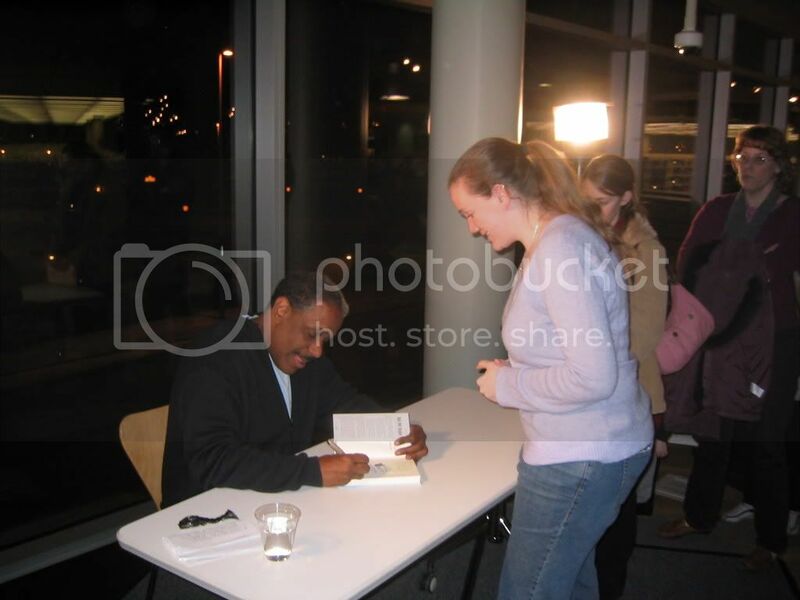 On Friday, February 2nd, 2007, Newbery winning author Christopher Paul Curtis came to the Plaza Library. He gave a great speech which really drew out the teens and kids in the audience. And the audience was packed! 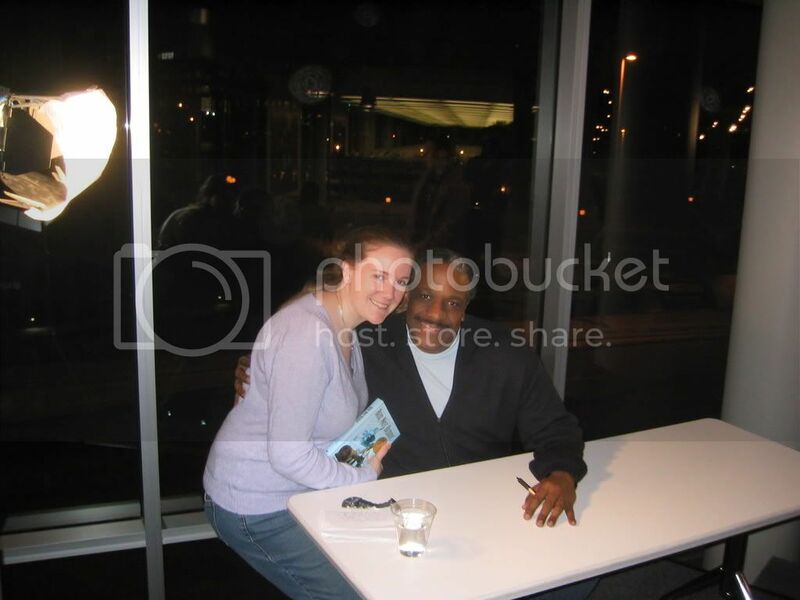 He signed books and posed for photos. Such a very nice man. Only a few days behind breaking news, but on February 1st, 2007, the CDC, Center for Disease Control released their new recommendations for dealing with a pandemic flu virus. Scariest thing I've read in a long time. Warning, thinking about this too hard will give you nightmares. Failure to think about it may be fatal. Read on or not at your own risk. I've heard, read, and studied about the 1918 Spanish Influenza Epidemic where huge numbers of Americans died. There is nothing to stop that from happening again. The new recommendations are based in part on studies of that epidemic and how the cities with the lowest mortality rates managed it. Of course some small towns cut off all communication with the outside world entirely. The new guidelines include a category system to rank the severity of the pandemic. This is similair to the system that exists for hurricaines. Here is a pretty chart with scary black at the top to indicate the most severe and deadly forms. See that is much scarier than those Homeland Security Levels were when they first came out in 2001. Because those numbers are already assuming that almost 1 in 3 people are sick. Also keep in mind that level one is really just a really bad year of the average flu virus. In an average year 36,000 people die of the flu in the United States. One thing to remember is that many of these decisions will be made at a local level because power to do things like close schools remains in the hands of city and county officials. Unless of course things start getting nationalized. And in a national emergency and panic that could happen. That's just as scary to the part of me that fears big government, big brother, federal government, and centralized power. This sort of thing would be devastating to our country economically, emotionally, and socially. The report specifically mentions encouraging "social distancing" for students (and adults but especially kids) out of school. That means no trips to the mall with your friends. Closing public gathering places means no movie theatres. However the report also mentions closing things such as churches. It means intentionally isolating yourself. Let's not forget the widespread panic that would incur among the general populace. Don't kid yourself, we're a nation of hypochondriacs who are easily driven to fear and irrational behaviors. This could ruin our economy. Businesses would suffer. No one would go to restaurants, stores, etc., if they could help it. People such as teachers and support staff in schools don't really want to take three months with no pay and taxpayers can't really afford to keep paying them. (Teachers with contracts and unions might be okay, but support staff such as cafeteria workers would not be.) What about students who rely on free lunches (as much as 60% in some urban areas) and breakfasts for their nutrition? Lowered nutrition will result in a weakened immune system and more suseptibility to disease. Plus we do not have enough medical professionals, pharmacies, hospitals, or health facilities and practitioners in general to deal with this. No one in the world has the resources to deal with (almost) 1 in 3 people being sick. In 1918, the flu spread in from the East Coast. That won't happen this time. It will be everywhere at once thanks to our highly mobile airplane society. It will be an international problem very quickly. And where does this leave libraries? Obviously we as libraries are public meeting and gathering places. If we do our job right, we're vibrant communtiy centers, the heart of much of what happens in our world. (Ah, but I wax idyllic.) So do we close? Everyone knows how much of a petrie dish is your average public library. Speaking as a children's librarian, I'm exposed to so many germs every day I'm considering buying stock in sudafed. And if the schools do close (worst case scenario) than we all know that desperate parents may turn to us as drop off points for their children to spend all day (heaven knows it happens in the summer and afterschool). Instead of being at the heart of the information spreading network for the community, we risk being at the heart of the disease spreading network. But we do close? I tend to think of us as being an essential service. For many on the wrong side of the digital divide, we are the only way they have to access the internet, and basic computing programs and word processing. But do I want to (literally) risk my life so someone can type up a resume and online job hunt? Let's not forget I'm the sole breadwinner for my household (which includes me and one cat). I can't afford to be out of work the time of a pandemic, especially if said time is unpaid. It's not an easy decision. And it isn't pleasant to think about at all. After the epidemic than what? We have a society in ruins, it's crumpling before our eyes. People have intentionally "socially distanced" themselves, creating isolationism. Our economy would have crumpled. It would be as changing for our society as 9/11. How do we recover? How do we rebuild when we've all been sick and so many of us have died? I know it can be done, I believe in the human spirit and the American spirit, but there is no way we come out unscathed or unchanged. Yes some positive things came out of 9/11, stories of heroism to inspire, a renewed sense of national identity and patriotism. But many negative things came too. The world changes, but it also keeps on turning. Though these reports have an apocalyptic feel to them, we must remember that it might hurt us, but I don't think in the end it could bring us down. In times of great challenges, we've often been surprised at how far we can rise. Even wars can bring about great technilogical and medical innovation. A phoenix can rise from the ash. I need to end positively with the hope that our country could come through this not only alive, but stronger and more unified, because I'm depressing myself thinking about the alternative. As we say in my home state of Kansas (our state motto), Ad Astra Per Aspra, to the stars through difficulties. As a continued part of Library 2.0, we were asked to play Runescape which is a massive multiplayer online role playing game (MMORPG). This is hugely popular with our library kids. After school and on the weekends about half of our comptuers are given over to this game. The kids exchange tips, play together, play against each other, etc. For a computer game, it is a remarkable social event, encouraging real life discussions in addition to the online cooperation. Of course it also starts arguements as kids steal each other's passwords, hack their accounts, etc. I know many librarians hate it and hate the computer time it "wastes". I've never done an RPG or a large computer one like this. I have some friends that do World of Warcraft (which requires the purchase of software and is a subscription based service). Unless we are to block it (which I understand some librarians are doing or are on the verge of doing), it is here to stay. I think it is important that before we block the site or run around prognosticating on the evils of runescape, we should at least try to understand it. A great deal of reading was recommended to me and I found more on my own. This article on Runescape from wikipedia is helpful as is the information in the "knowledge base" portion of the runescape website. It is interesting that part of the sucess of this game is that it has a free component and it requires no additional software or downloads but can be played from any web browser. The program is written in java which results in some limits in graphics, but it is fairly good for all that. These are all important elements as to why we see it so much in libraries. My library, like many libraries, blocks all attempts by users to download and save things to computers (an annoying but necessary precaution). Many of our patrons (urban library) do not have computers and/or (high-speed) internet access at home. They would only be able to play a game like this with the conditions (free, works from web browsers) that Runescape provides. Options such as World of Warcraft and Second Life are not a possibility for these kids. To begin with I created my character a cute woman/girl with pigtails and a fun blue dress. I named her laughingliz if any of you want to find me online and be my "friend". All that we were required to do for staff day was to make it through tutorial island and add a specific librarian's character as a friend so she would know we really played. All new players are first put in tutorial island which teaches you how to operate controls and perform some simple tasks. They aslo give you various things you will need in the runescape realm. While there are other beginners (or noobs in internet speak) in tutorial island, you do not interact directly with them. I had only a few problems with tutorial island, it didn't seem that much more complicated than Sims which I've played before. There were more controllers and options, all of which are thrown at you at alarming speeds, but other than that it was okay. I was feeling fairly confident because I was having so much less trouble with this than some of my coworkers. And confidence, much like pride, goes before a fall. With my tutorial island "success", I decided I wanted to understand this whole thing better and I headed off to the real world of runescape to try my hand. I found it very overwhelming at first. I started off as suggested and talked to the various NPCs (non-player characters, basically computer generated characters) to ask for help and advice. There are these tutors and guides. They recommend catching fish or mining to make money. So I caught fish and I mined and I had no idea how that was supposed to become money. In the meantime I was observing the social interactions of my various players (who I guessed were greatly in that teen and tween demographic). I found "listening" to their conversations (which are displayed in text for all to see) one of the most fascinating things. They were recognizing friends, forming groups, social bonds, exchaning myspace pages, etc. Very cool. And since there are no profiles, they accepted me as one of their own and didn't know that I was in fact a 24 year-old librarian spying on them. Marvelous! No clamming up like they normally do when I walk round the bend. In fact I've even had a couple of people offer to be my boyfriend (or bf in internet jargon). The game is much more chaotic and confusing outside the safety of tutorial island. I had trouble translating skills into money or undertsanding all the steps that go into producing anything, going up levels in various skills, etc. And people kept attacking me! I killed one person and felt just awful about it (I didn't know about running away and he started it) until I realized it was just an NPC. I was rather frustrated about what I should do next as I was having trouble making some of the leaps you need to. I don't like not understanding something or failing at it. My stubborn streak kicked in with a need to "master" or at least get the basics of this game. Fortunately one of my fellow staff members is quite a runescape aficionado and has become my guru. What started out as a simple quest to understand it has turned into a genuine liking for the game. I'm stubborn and wasn't going to give up until I understood the entire thing better and to my surprise it ended up being fun. I don't like fighting other characters or NPCs too well (I've now learned about running away and have been saved a couple of times by other players though I did die once), but I like some of the skills of it and it is just the right balance of mindless/challenging to keep my brain-dead self after work. Unlike many people, I seem to have about a 30 or 45 minute limit for how long I can stand to play. I've played a few times over the last week and a half and managed to raise my skill level in various categories such as cooking, crafting, mining, and smelting. (Numerous attacks finally forced me to spend a little time fighting to raise my levels there, but I didn't like it). I'm not sure how much longer I'll keep playing, but it is sort of fun. Playing runescape has given me a way to talk to kids who've previously been rather wary of librarians as authority figures. In fact one of them is now my runescape friend! I've gone to them for advice and with questions and they like to be able to help the librarian out. Plus it helps me a lot to understand what they're fighting about (in the maybe two incidents we've had over runescape) and what they're doing. I have a lot more respect for the game. Players have to use logic to solve certain puzzles. As you're learning a skill, you will fail a certain number of tries much like in real life. (I've burnt a good deal of bread for example.) That teaches patience and persistence. It takes many steps and some planning to produce some items. Not to mention kids learn computer skills. All of these are good things. Yes, runescape does occupy our computers and our bandwidth, but is it any less valid of a use than some adult who is surfing match.com or playing online chess? (And to be fair I've seen adult patrons who were runescape addicts too). Nope. Plus we're building up kids to like the library as that nice place you can go to play runescape (and maybe since they're already here we can engage them in other activities). One concern, that fellow Kansas City Public Librarian Clare pointed out in her blog is that according to Runescape rules you have to be 13 to play on the game. (This is because kids uner 13 don't understand the danger of giving personal information online.) To use computers in our kid section you have to be under 13. And yet they're all playing runescape. I was working with a boy today who couldn't have been more than 8 or 9 and yet he's a whiz at Runescape. Here's my thought, it isn't my job to police and enforce the rules that runescape has established. Nor do I want at all to be the evil librarian who prevented the kids from playing a game they love. They'll leave and they won't come back period. I'm not turning them against the library like that. I refuse to be a totalitarian librarian or a parent figure. I'd rather be their friend, help them with the game, with the library, and maybe sneak in a little bit of talk about online security (in brief 45 second bursts). It is something to help our kids be vigilent about, but it isn't ours to enforce. For the most part this game is overly beneficial to our kids, it gets them in the libraries. If librarians give this game a decent chance (I recommend an hour or so, it took me two sessions, maybe 60-75 minutes to get through tutorial island and a little time in the real version of the game) maybe 20 or 3 hours total and it doesn't have to be at once. Even if you don't like it, or don't become a regular player, it will open your eyes to what your kids are doing. You can start conversations with thsoe kids who come in, go straight to the computers, and never talk to you. Ask for help, they'll love it. And I bet they start talking to you more, asking for help with other things, and your relationship with them will expand outside of runescape. This could be a great way to connect to those kids. News of this sort spreads wide and quick, but here you go. The seventh (and final) Harry Potter book, Harry Potter and the Deathly Hallows will be released on July 21st. The price is $34.99 (ouch), though amazon.com is already pre-order selling it for $18.95. I'm betting Harry dies. It seems as though that would be the only way to properly vanquish Voldemort. Before placing my amazon.com pre-order, I'll wait to see what Borders does for the pre-order. With the previous two books, I've just pre-ordered through them and picked up day of.